We often hear about the myriad benefits of eating raw, whole foods—and when it comes to fruits and veggies, this is often the case. However, when it comes to nuts and seeds, going raw can come with its own set of complications. Raw nuts and seeds that have not gone through a soaking, rinsing a drying process before consumption can lead to all sorts of health problems. This article will explain you why it is important to soak nuts and seed to make sure you get the most out of them. Raw nuts and seeds have high levels of phytic acid. Phytic acid is a substance that serves a beneficial and protective purpose for nuts, seeds, legumes and grains before they have germinated. It coats the outsides of these would-be plants in order to keep them safe from outside elements before they can be put in the ground and gardened. However, as good as phytic acid is for these nuts and seeds, it’s not so good at all for humans to consume high amount of phytic acid which contributes to a number of health-related issues, including gastrointestinal distress and even malnutrition due to mineral deficiency. Thus, it’s important to keep an eye out for foods that contain phytic acid and to take steps to strip it away before eating them. Which foods are high in phytic acid? Phytic acid is just one culprit that plagues raw nuts, seeds, grains and legumes when it hasn’t been soaked away. Ditch the tannin – Tannin is something many people associate with black tea and red wine, and many people have sensitivities to tannins, leaving them feeling unwell after consuming it. Soaking away the tannins—along with the phytic acid—can help to keep you feeling better when you eat raw health foods. Blocked mineral absorption – According to a study, soaking nuts or seeds can make it a lot easier to absorb their minerals such as iron, zinc and calcium. Because phytic acid binds to certain minerals whenever it encounters them—including in the human digestive tract—it can block the absorption of various essential minerals by the digestive tract, leading to deficiencies in such minerals as zinc, iron and magnesium. This block of digestive absorption could lead to serious problems like bone loss if allowed to go on unchecked. Facilitate gluten digestion – By soaking whole grains, you can help to activate enzymes that assist with breaking down the gluten contained therein. This process also deactivates enzyme inhibitors that interfere with the natural digestive process and lead to digestive problems. Prevent irritable bowel syndrome (IBS) – As mentioned above, soaking nuts and seeds, grains and legumes can disarm naturally occurring enzyme inhibitors that create gastrointestinal distress when present in the gut. These enzyme inhibitors are helpful to the seeds themselves, as it prevent them from sprouting in the absence of optimal conditions (i.e., in areas where there is little water, a seed will want to remain dormant until water becomes more abundant), but they are harmful to humans when consumed and can cause IBS (if you suffer from IBS, read about the best treatments to relieve IBS). Promote colon health – Cleansing nuts and seeds with a good soak before eating them can also help to cleanse your colon, sweeping away toxins and paving the way for better nutrient absorption. 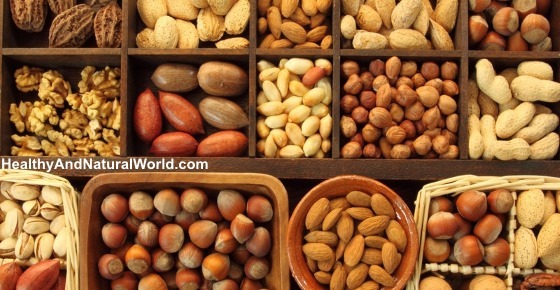 A colon that is constantly bombarded with phytic acid and other irritants from unsoaked nuts and seeds is less apt to function at its optimal level, and this can lead to discomfort and increased risk of illness. In fact, a 2014 study published in the International Journal of Pharmaceutical Sciences and Research showed that phytic acid interfered with digestion of starches. For a healthier digestive tract, reduce phytic acid levels in nuts and seeds by soaking first. Now that you know what to do, you need to know how to do it—and you may be surprised at how incredibly easy it is to soak away the harmful stuff and get the most out of your nuts, seeds, grains and legumes. Cover the nuts or seeds with a mixture of 1-2 tablespoons sea salt per 1 quart of water. It is suggested that salt helps activate enzymes that help to break down phytate. But I was unable to find any study supporting this claim. Note: When soaking wheat grains, it is advisable to place a tablespoon of apple cider vinegar or the juice of half a lemon into each quart of water used for soaking to aid in the breakdown and removal of toxic coatings. The following scientific study mentioned that “soaking at temperature between 45 and 65 °C and pH value between 5 and 6 a considerable percentage of phytate was hydrolysed”. Salt water alone will suffice for other nuts, seeds, and legumes. Water should be filtered or boiled and cooled prior to being used for soaking, and should be discarded after the soaking is through. Soaking is suitable if you consume high amount of foods containing phytic acid. Usually a healthy digestive system can tolerate a certain amount of phytic acid, and if your nutrition is varied then it will compensate for the nutritional loss. Also ask yourself if you experience stomach pain after eating foods that contain phytic acid. These factors will help you to decide if soaking is suitable for you. Another thing to consider is that while most nuts and seeds stand up well to soaking, some nuts and seeds don’t. Soaking flax seeds creates gooey texture, and Brazil nuts don’t soak well due to their high fat content. Hi Jenny, I usually soak a small amount of nuts and seeds in a blender for 4 hours or more before I make my smoothie together with few fruits and green veggies but I don’t rinse the nuts and seeds. Is this an alright thing to do? Thanks. Hi Paulina, it’s good to rinse the nuts and seeds as they are soaked in salty water and rinsing them will make sure the saltiness does not affect the taste. I also read that the water in the bowl contains all the enzymes, acids and byproducts you are trying to remove from the nuts by soaking them, so best to rinse them. Hi,i bought roasted almonds,should i need to soak in salty water before eat? I’m not sure I know the answer as I personally buy raw nuts, but from what I’ve read roasting reduces the phytate content of nuts. However roasted nuts that you buy from the supermarkets are often not roasted but deep fried, unless it is says “dry roasted” and in this case there is nothing healthy about them and probably no point in soaking them.